My son has the A22 custom brace for post ACL reconstruction, just want to make sure this impact guard will work with the A22 brace, Thanks. Yes, you can use the DonJoy Impact Guard Knee And Shin Protector with the A22 knee brace. I'm confused as to which braces this is compatible with. I'm looking for something to protect the knee while diving for balls in rec football after a microfracture of the tibial plateau. I also have an old meniscus tear and jumper's knee and was going to go with a reaction brace but I don't think that would be compatible. It would be helpful if there was a link or some way to tell which "hard" braces are compatible. Thanks. 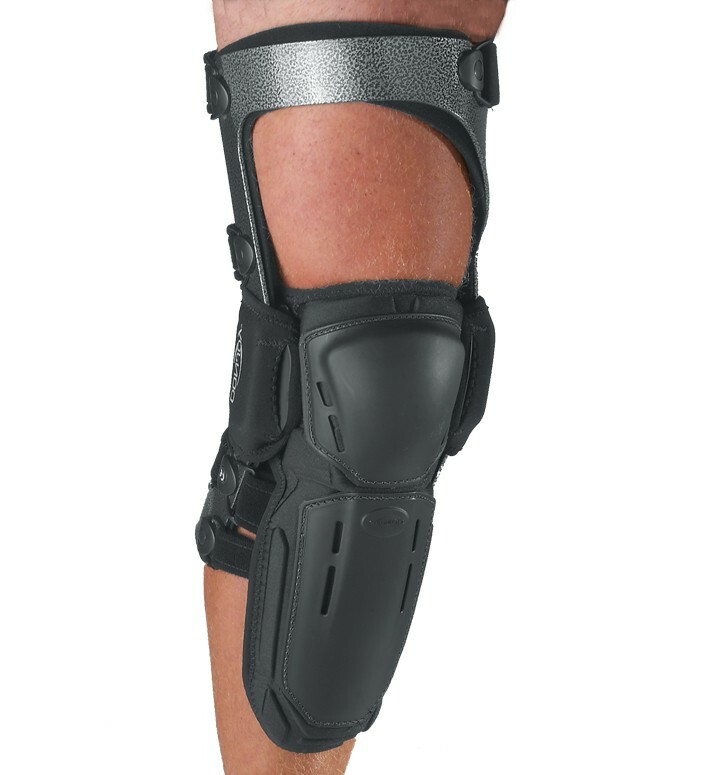 The DonJoy Impact Guard Knee And Shin Protector is compatible with any of the DonJoy Rigid Hinged braces, like the Armor, or the FullForce. We do not have replacement screws but the impact guard can be attached to the brace without screws. There is a plastic piece on each side that can slide into the hinge area to keep it in place. is this attachment easy to install and remove? And Must the impact guard be removed in order to take the brace off the knee? I have a pair of older OA braces (2008, 2010); will this fit these? You can use the impact guard on an OA brace as long as the offloading adjustment is Not on the hinge. The guard is attached to the hinges and wraps around the hinges so you would not be able to offload if that adjustment is done at the hinge. what are all of the knee braces that the impact guard attachment is compatible with? and when you place an order for a custom brace, and also order the impact attachment, will the attachment come already installed on the brace when you receive it. .
can these be used for roller derby? I am having an impossible time finding a knee pad that I can use over the defiance! Is this attachment compatible with the DonJoy SE-4 Knee Brace? Please send us an email @ service@betterbraces.com with your brace serial #. With this we can determine the correct size.